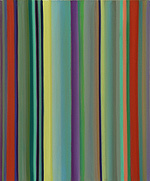 Chris Gallagher paints luminous bands of color that arc, stream, and undulate across panels and canvases from edge to edge. 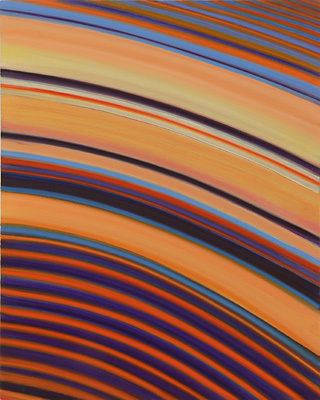 In lively, multi-hued color combinations, the artist uses varying striations to invoke the appearance of radiant energy flowing beyond the limits of the images. The expanding fields suggest details of transcendent quantum or cosmic phenomena, yet the immediacy of the artist's gesture is always evident. 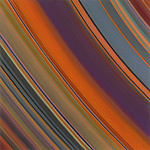 Gallagher builds up the vibrant ribbons in each painting from single brushstrokes that span the entire canvas. Even in large pieces, the work is grounded in the human-scale sweep of the artist’s reach. Working with wet-on-wet paint application, he selects band widths and colors intuitively and in reaction to preceding choices. Gallagher revises and glazes layer upon layer as the bands accumulate, until each composition ultimately coalesces. Whereas past paintings were completed in a more direct manner, the introduction of incremental revision allows for spontaneity and unexpected outcomes. 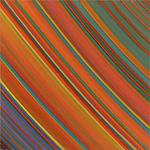 The direction of the color bands greatly affects the illusion of space in Gallagher’s paintings. In some compositions, the linear flow is essentially parallel with minimal curvature, though the evidence of the artist’s hand is still present in lines that waver or tremble. When the colors stream horizontally, the allusion to landscape and seascape is more pronounced as vistas seem to both move toward and recede away from the viewer. In contrast, vertically oriented bands cast a translucent, wavering scrim close to the picture plane. With the suggestion of something more tangible, the spatial fields undulate while movement of the lines suggests a capture of phenomena beyond the image field. Another composition style features curved lines accelerating diagonally across the canvas with a whirling rotational energy. These concentric, off-kilter arcs intersect all four edges of the painting and direct the viewer’s eye repeatedly from the center to the margins, then back again. Subtle warps and bulges appear in the compositions as the planar field tilts and recedes into space, or drops forward toward the viewer. Even more so than in prior work, Gallagher has created atmospheric fields with perspectival depth to enhance the sensation of movement and multi-dimensional, pulsating energy.